At the 125th anniversary of the Kunstmuseum Berne, the speeches given by the president of the museum’s board of directors, the chief counsel of Pro Helvetia and the director of the museum were secretly recorded. In the same night the sound file was taken to a building across the street and slightly altered. 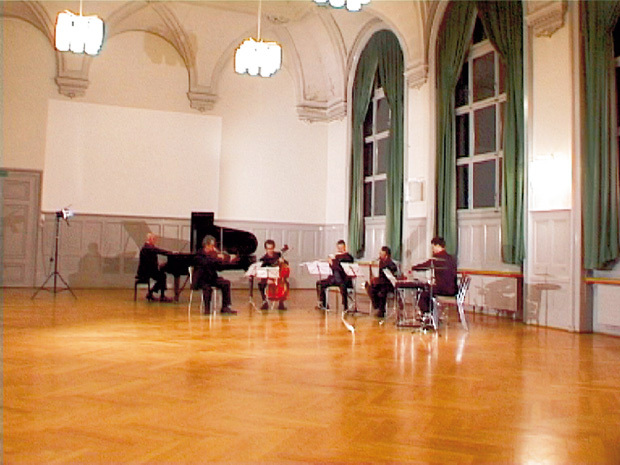 The new recording was then played back into a room where the ensemble for new music zurich was assembled. They had to endure the entire length of the speeches but were allowed to fill in the parts between the recorded talking. In the first part they performed a short musical piece, in the second part they had to kiss their instruments and in the last part they threw their instruments into the room. The action was filmed and transferred to a DVD. The next morning, Bern University of the Arts presented the DVD as a gift to the museum as a historic document. Special thanks to Bern University of the Arts.